I’m sitting staring at my computer screen. Writing about food seems inconsequential in a toxic political moment where hate has been normalized to unthinkable levels. And yet … food can be a cultural bridge, a way to bring communities together. If we ever needed food, it is now. I open my copy of Wild Fermentation: The Flavor, Nutrition and Craft of Live-Culture Foods. I find that that Sandor Ellix Katz, the fermentation guru and master who has inspired so many to explore the world of wild foods, always has a way to reflect on culture and society through his writing. While he writes amount fermented foods, the meaning is always deeper. "Wild fermentation is a way of incorporating the wild into your body, becoming one with the natural world. Wild foods, microbial cultures included, posses a great, unmediated life force, which can help us lower our susceptibility to disease and adapt to shifting conditions." Taking a look at the state of the world, "shifting conditions" would be putting it lightly. The world doesn’t just feel like it is shifting, it feels tumultuous. In the midst of that turmoil, the proverbial shared meal is of even more importance. Food can be a cultural gap, a way of bringing us together. It connects us to the past. It connects us to the future. It connects us to place. Food is a way for us to share and convene, to refuel, both physically and emotionally. Is that putting too much importance on what we eat? Perhaps. I don’t necessarily believe that one meal will start a revolution, and sitting at home in front of a meal does not replace action in the streets, supporting an organization, or advocating for change. But one meal leads to another, which leads to another, and another. And what is a revolution but the sum of many parts? What if we all sat down for a shared meal with someone on the other side of the political battlefield? What if we all took a few hours out of our week to stop updating our newsfeeds and make a meal and share it with our friends? What if we took the time to learn the food of other cultures? That brings us back to the idea of cultures, both our social kind and the environmental kind. Without bacteria, we won’t survive. We need those cultures, we need diversity, and this is a lesson. Fermentation is after all a reflection of diversity; a reminder that while we might want to control our world, turn it into what we want it to look like, we are meant for diversity and difference. "We cannot resist the homogenization of culture by overpowering it. Yet we must not resign ourselves to it. Resistance is everywhere at the margins, where the people who manage to avoid succumbing to mainstream cultural currents come together. In the margins, we create and support diverse alternative cultures that express our various needs and desires," writes Katz. At the outset, getting a batch of pickles or kimchi going might not solve our political problems, but it certainly won’t make them any worse. On the contrary, fermented foods are a reminder of the fluidity of things, that our world is dictated not by us, but by natural forces, and that change is always inevitable. As Katz writes, "what gives me hope is the simple notion that current trends do not necessarily have to continue. It seems to me that they cannot possible. The revolutionary spirit of liberation and hope always and everywhere remains, even dormant or confined to dreams, like a seed culture, ready anytime to multiply, thrive, and transform, given the right conditions. As Katz puts it, social change is also a form of fermentation; our ideas and dreams bubbling and transforming until they become reality. 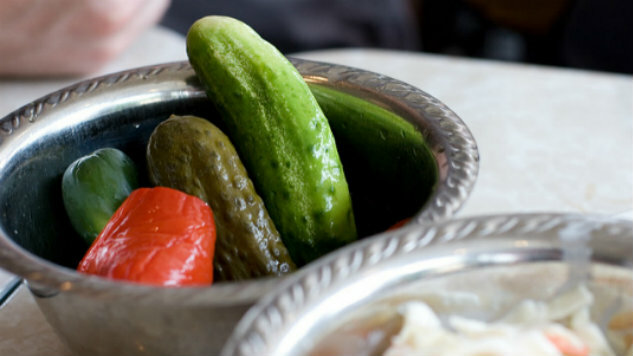 What better way to honor the possibility of that transformation than through fermented food? If you’re like me, you find comfort in food. But maybe we can also think of food as an impetus for social change; that the food we put in our bodies and share on our tables is not just to nourish us, but to be a spark for conversation, for a revolution. We live in an overwhelming world. But we can only judge ourselves upon our response to situations. It is not the situation that the world puts us in that defines who we are, it is how we respond to those situations. We can choose a sustainable, ethical, just path forward with our everyday actions. For me, I choose diversity. I choose culture. I choose social change. Those are values that I will reflect in my words and actions, but also in the food on my table. As Katz highlights, we really have no other choice. "Homo sapiens prone to feeling overly confident of our superiority and ability to dominate would do well to ponder a small bit of wisdom attributed to Louis Pasteur himself: It’s the microbes that will have the last word."